The dominant hormone regulating metabolic homeostasis and the switch between the anabolic and catabolic states is insulin. 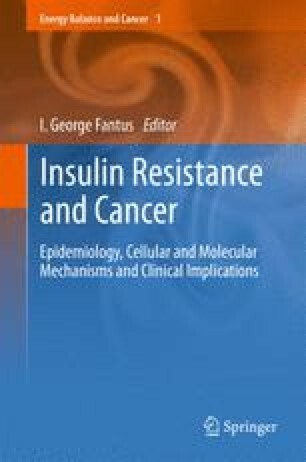 At the cellular level, the action of insulin and the closely related insulin-like growth factors (IGF)-1 and -2, are mediated through a complex network of diverging and converging events (reviewed in ). The insulin and IGF-1 receptors (IR and IGF-1R) are members of the family of receptor tyrosine kinases. Following hormone binding, these receptors undergo autophosphorylation, which activates the kinase toward other substrates termed the insulin receptor substrate (IRS) proteins. In contrast to most other tyrosine kinase receptors, it is the phosphorylated IRS proteins, rather than the receptors themselves, that link the action of these hormones to two main signaling pathways: the phosphatidylinositol 3-kinase (PI3K)-Akt pathway, which is responsible for most of the metabolic actions of insulin, and the Ras-MAP kinase pathway, which regulates expression of some genes and cooperates with the PI3K pathway to control cell growth and differentiation (reviewed in ) (Fig. 2.1).